We hope that during your visit to Thailand, you will take the opportunity to let us treat you with the gracious Thai hospitality our country is known for. The 448-room Indra Regent Hotel is situated in central Bangkok, right in the shopping district and a few minutes from major historical and tourist attractions. The Indra Regent Hotel offers spacious accommodations, deluxe furnishings and exceptional comfort. Indulge in delicious continental cuisine with impeccable service, or savour an evening of authentic Thai cuisine and classical performance at the Indra Regent Hotel. Experience a most relaxing and memorable stay at the Indra Regent Hotel with rooms that offer a world of peace and comfort in the bustling heart of Bangkok. Our variety of 448 rooms and suites include comfortable triple accommodations, family style with 2 rooms connected by a hallway, Chinese and Thai theme suites, and 2 Presidential Suites. All our guest rooms are decorated with Thai teakwood furnishings and come complete with individually controlled central air-conditioning, in-room safe, coffee and tea making facilities, international direct dial telephone, satellite television, fully-stocked mini bar and refrigerator, and bathroom-en-suite with hairdryer & toiletries.The Executive Floor is equipped with additional amenities and services to accommodate discerning business and VIP travellers. Non-smoking rooms are also available on request. Sala Tahi : Set among serene surroundings of lush greenery and lotus ponds is the Sala Thai Restaurant, a 13th century masterpiece teak pavilion and our tribute to Thailand's glorious past as the Kingdom of Siam. Here, we have preserved the distinctive flavours of royal Thai cuisine complemented by gracefully presented exotic fruits and sweets. The highlight of the evening is classical dance performances featuring different eras of Thai history, accompanied by the sounds of traditional Thai instruments. The Botanica Buffet & Grill : Restaurant is richly decorated with rustic sandstone walls, ceiling-high gilded banana trees and a lush floral mural. This refreshing venue features international buffet luncheons and dinners as well as superb Continental a la carte dinner cuisine. Signature dishes are prepared at your table side such as the famous French Black Pepper Steak. Enjoy the abundant selection of delicacies with a view of the gardens at the pool and the hand-carved Sala Thai Restaurant. Ming Court : From the royal kitchen of the Ming Dynasty, the Ming Court offers authentic Chinese cuisine from our master chefs. A wide variety of Dim Sum is served fresh during lunch and our special set menus let you savor a wide array of Chinese delicacies for just 300 baht. Special Chinese banquets can be pre-arranged to be served in the private dining rooms at the Ming Palace. For guests who would like to keep in shape while away from home, we offer an outdoor swimming pool, fitness center, open-air tennis court, table tennis and a snooker room. Further services and facilities provided by the Indra Regent include sightseeing & tour services, foreign exchange, commercial bank, medical clinic, post office, 24hr. limousine service, barber shop, beauty salon, Thai traditional massage, sauna, same day laundry service, and baby-sitting service. 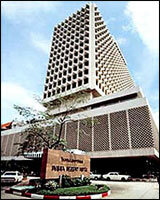 The Indra Regent houses a large shopping arcade offering a variety of local products. Whether it is a gift of jewelry for someone special or Thai antiques and handicrafts for your home's decoration you are sure to find it in the Indra Shopping Arcade. Other shopping centers are also just within a few kilometers reach. The Indra Regent's function rooms are highly popular among local and international guests who recognize our great value for money. Our spacious rooms cater up to 1500 people and special requests are always welcome. Whether you choose to hold a formal banquet in our elegant Emerald Ballroom, a theatre-style conference in the exclusive Sky Room, or a casual barbeque party at the Garden Terrace, our well-trained staff will make sure that your event turns out to be an impressive and memorable one. To our discerning business and VIP travellers, the Indra Regent offers a range of services including conference facilities, secretarial and translation services, parcel and postal services, facsimile transmission and photocopying.